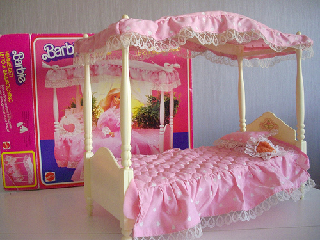 It wasn't enough for us to not have enough room for our own belongings as a child, but we had to go and move in Barbie, her boyfriend, Ken, her sister, Skipper, along with all of their friends, and everything they owned. We may have had beans for dinner, but Barbie was living it up! She had several houses, cars, a swimming pool, and right thousand shoes with no mate! Shoot! She even had an RV in case she needed to get away from it all. The Townhouse, the Dream House, and all the clothes were too much for her I guess. Come on Barbie, let's go party! Funny song, but I really do think I should add Barbie to my friends list.